Senior Worrorra elders Donny Woolagoodja and Janet Oobagooma look over stone tools on Vic Cox's deceased estate with anthropologist Kim Doohan who is a long time friend and consultant for Dambimagari Aboriginal Corporation. This is an aerial view overlooking land very close to where I found the stone tools. I recorded this photo from a helicopter on our way back from Worrorra Country. This image shows an abandoned leprosy hospital called Bungarun, our house is very close by. This area is the bottom of the King Sound and Worrorra country is at the entrance of the sounds, 180km distance but because of the rough terrain it can take 9 hours to drive, most people access it by water. A selection of the stone tools found on the property we mortgaged, the deceased estate of Vic Cox. Intended exhibition display. Purpose is to show you how exhibited artworks and stone tools can sit together within an exhibition space. These are Water colour paintings of the stone tools. 2016/17 size: A4. This painting process helped me to develop the idea of breaking the stones shards into separate printing plates. I understand this will be considered as two images. Each stone tool has shards of stone that have been removed during the shaping of the stone tool. While making drawn studies of the tools I separated each tool into individual shards, like a jigsaw puzzle, the drawings were turned into graphics which were cut out of aluminum sheets using a plasma cutter. Basically each stone tool is broken into aluminum puzzle pieces, which I then etch, ink and press into 350gsm printmaking paper rebuilding the stone tool shard by shard. Aluminum printing plates left exposed to Kimberley environment and wildlife to accumulate marks before printing. Stone Spear Tip, Vic Cox Collection, found marked with place name and date. The markings are how I could connect the the tools with the Worrorra custodians. Print Test Stone Spear Tip 2016 size: 135 x 95cm. First monotype prints made at Basil Hall's print studio in Braidwood NSW 2016. Each stone shard is a separate plate, cut, inked and pressed through the printing press. The textured background (scratches) is the imprint of a large metal sheet that I found lying in the bush, worn from exposure to the harsh Kimberley environment for a long period of time. Working with master print-maker Basil Hall in his studio in Braidwood, NSW. This was where I tested my plates and achieve strong results. Training and support with Basil Hall was supported by creative and professional development grants by DCA and Country Arts WA in 2016. Work from this residency has been short listed for the Hedland Art Awards. 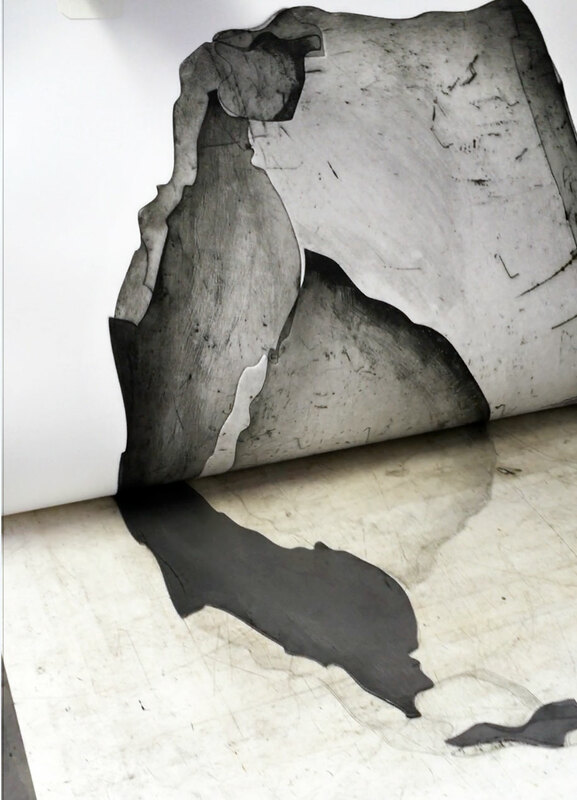 Baldessin Press Residency will give me the opportunity to work mostly independently to produce the whole series. These are aluminum plates cut into shards drawn directly from each stone tool. They have been inked and are ready to be put through the printing press. Each stone tool is made up of multiple shards, like a jigsaw puzzle I put the tool back together piece by piece. This image was taken at Basil Hall's printmaking workshop in Braidwood, NSW Dec, 2016. (Images in background are not my work, just part of Basil's studio, please do not count as support material images). 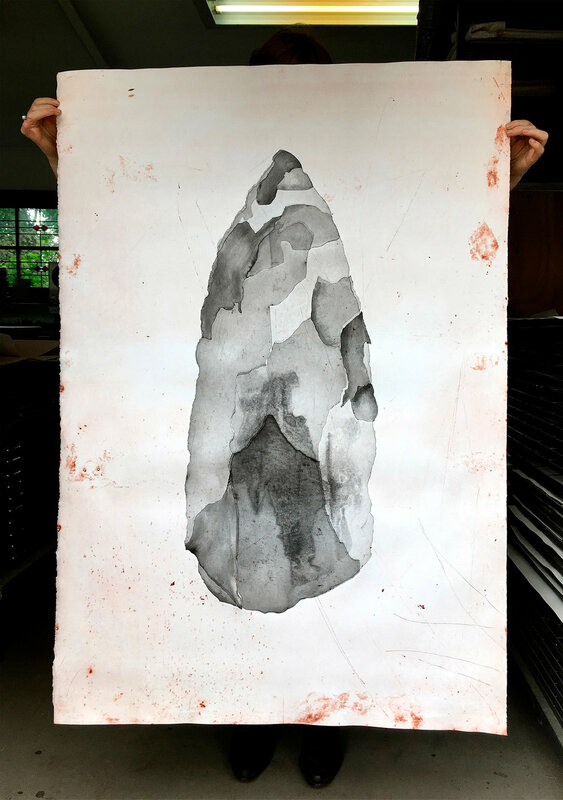 Stone Axe Head, monotype test, 2016, size: 135 x 95cm. This is one of the first large monotype prints that I made at Basil Hall print studio in Braidwood NSW. You can see all the different plates (shards) that make up the whole stone tool. This image is a direct study of the stone tool. The paper is embossed at the edge of every new plate, you can see this very slightly in this image. 3D Thread and Ochre Drawing, Port Hedland Courthouse Gallery 2017. This drawing represents a termite mound and the ochre the red earth of the Kimberley. Termite mounds are distinctive features in the Kimberley landscape. This was drawn using over 2500 metres of cotton dyed with Kimberley ochre. This is a tintype (old photographic process) of a quartz stone tool. This will be another body of work in the future. I have added this image to show you the potential this body of work has for exploration through other mediums. This photo was taken during the DCA and Country Arts WA supported training with Ellie Young at Gold Street Studios 2016. Recording stories about ornmol (ochre) at Kupungarri, Mt Barnett. My role at Mowanjum Art & Culture Centre includes managing a media centre where I train local community members to record stories. I am the camera operator standing (front right) while supporting trainee Mary Lou Divilli (left) who is recording audio. As I propose to record audio interviews with Worrorra people for the exhibition and catalogue, I have included this image as evidence of my recording work.